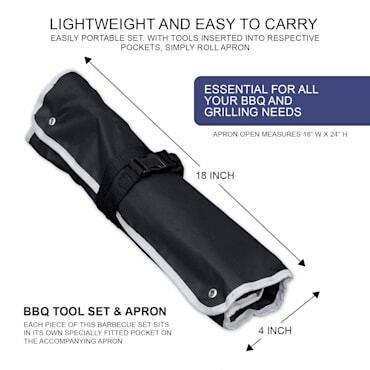 Start grilling like a pro with this our kitchen outdoor BBQ Apron and Utensil Set! 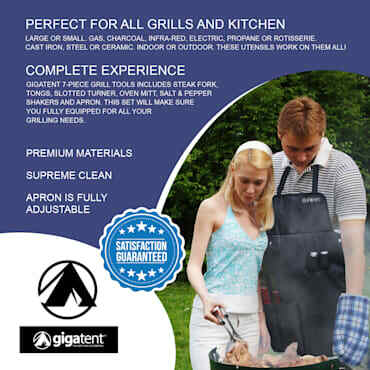 This exclusive outdoor cooking set offers stainless steel design for quality utensils that are built to last. 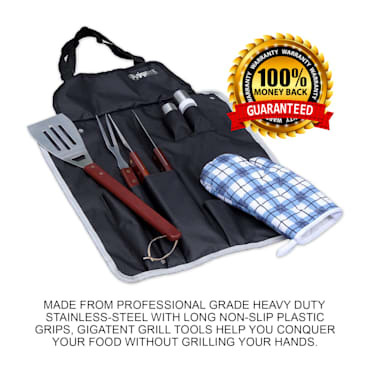 Featuring a wide variety of essential barbecue tools, this good-looking set comes complete with its very own custom apron so cooking tools are always within reach. This excellent travel utensil set is dishwasher safe. Slotted Turner with built-In Bottle Opener, Fork, Tongs, Oven Mitt, and Salt and Pepper Shakers. Specially designed for homes and outdoor activities such as; camping, BBQ, party, travels, fishing, hunting, and picnic! 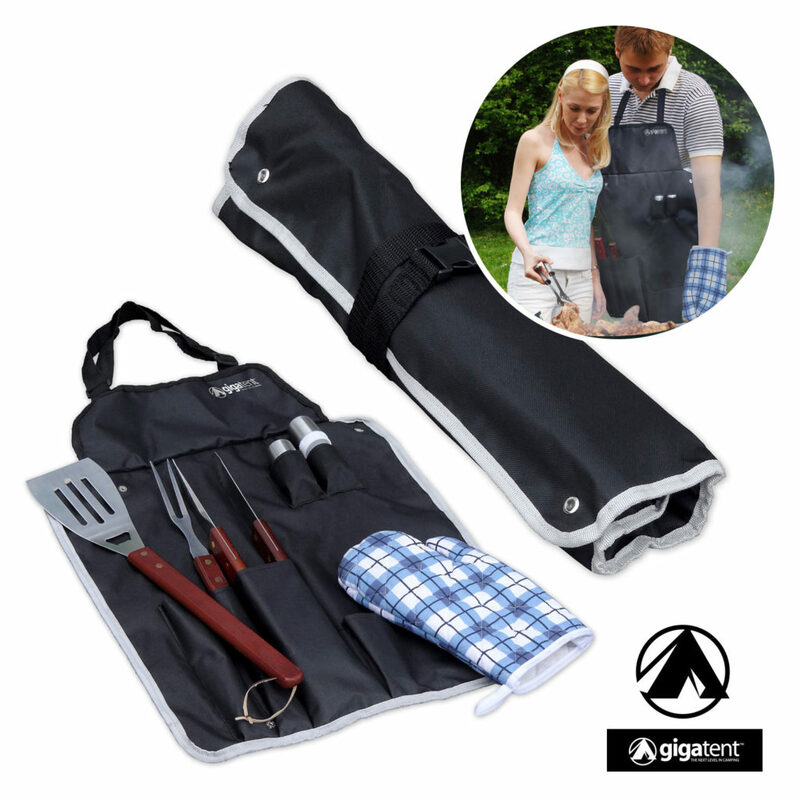 Each piece of this barbecue set sits in its own specially fitted pocket on the accompanying apron. The apron is polyester 600 D, and the included oven mitt is right-handed. 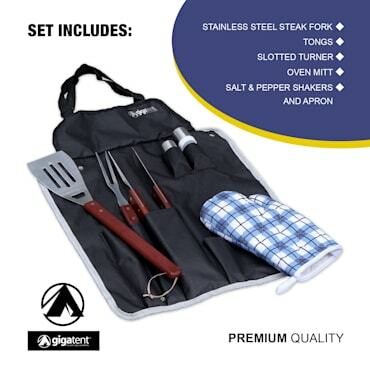 Set Includes Steak Fork, Tongs, Slotted Turner, Oven Mitt, Salt & Pepper Shakers and Apron. The apron is fully adjustable with neck and waist nylon straps and clips. Easily portable set. With tools inserted into respective pockets, simply roll apron closed and secure with snaps and nylon straps. Essential for all your BBQ and grilling needs. Apron open measures 18” W x 24” H.
The set closed measures 4” Diameter x 18 Long.